The Best Pest Control Service in Spring Hill, Florida says: Don't Be Buggin'! You've found Pest Control of Spring Hill. The perfect place if you need reliable and effective pest control and extermination services. In Spring Hill, Florida due to the hot, humid weather there are many common pests including roaches and ants that can find their way inside your home if you aren’t protected. Why does Pest Control of Spring Hill come up first when you google pest control near me or pest control companies near me? Because quite simply, we are the #1 pest control company in Spring Hill Florida! We offer one-time pest control treatments for your Spring Hill home, but the most reliable and efficient way to keep pests away is through a pest prevention plan. We recommend our affordable monthly pest control services to keep your home or business pest free. 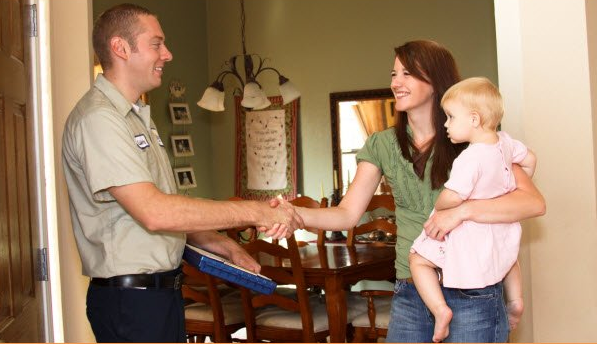 If you prefer our one time extermination service, our friendly representatives will gladly discuss the best options for your needs when you give us a call today for your free home inspection. Think you can't Afford Pest Control? We'll show you that you CAN! We think you'll be surprised at just how affordable and convenient pest control can be for your home or business. Whether it's ants, roaches, spiders, mice, squirrels, raccoons or rats in your household or business, Pest Control of Spring Hill is ready to rid you of these annoying pests. We have the know how to keep you and your family safe while your home or business receives treatment. We will work with your schedule to avoid any disruptions to your daily routine. We offer one-time pest control treatments for your Spring Hill home, but the most reliable and efficient way to keep pests away is through a pest prevention plan. We recommend our affordable monthly pest control services to keep your home or business pest free. If you prefer our one time extermination service, our friendly representatives will gladly discuss the best options for your needs when you give us a call 352-398-4822 or fill out our convenient form for more information. There are two common fire ant species found in Florida. They are the red imported fire and and the tropical fire ant. We've all experienced or know someone who has experienced the burning sting from Fire Ants. Fire Ants are a very common problem in Florida. These extremely aggressive ants can ruin your day if you accidentally disturb their nest. Their bite leaves a stinging venom that causes a painful burning sensation and leaves extremely itchy bumps behind. Pest Control of Spring Hill will utilize fire ant baiting technology to ensure the thorough removal of fire ant colonies from around your yard. If you find a fire ant mound on your property keep everyone away from it, especially children and pets. Do not disturb it and keep a safe distance away from the mound. Call Pest Control of Spring Hill to set up a fire ant program to eradicate existing fire ant mounds and help prevent future mounds from forming. Bed Bugs although not thought to be a common pest continue to be a growing problem in the United States. Bed bug infestations have had a massive increase in over the past 20 years. Although bed bugs may seem like an uncommon pest issue, these biting pests have become more common recent years. We have seen an increase in bed bug infestations in Spring Hill. Bed bugs can cause a great deal of anxiety for our customers. While they are hard to remove, we are dedicated to removing not only the bed bugs but also the anxiety associated with them. You can sleep peacefully knowing that your bed bug problem will be taken care of by Pest Control of Spring Hill. The three most common types of cockroaches in Florida are the German roach, the American roach and the Smoky Brown roach. In Florida they are also known as water bugs or palmetto bugs. It can be very difficult to remove cockroaches that have made themselves at home in your house. They will eat your food, damage electronics, books, and make themselves comfortable in your clothes. Some cockroach species also spread germs to humans. At Pest Control of Spring Hill we serve these pests an eviction notice and keep them from coming back by. There are numerous species of spiders found in Florida. While most spiders are creepy, they are harmless. However, there are five of which that are poisonous: the brown recluse, the brown widow, the southern black widow, the red widow and the northern black widow. If you see spiders in your home and you’re not familiar with the different species of spiders, it's a good idea to leave them alone and call an expert. Pest Control of Spring Hill can inspect your home for spiders and provide treatment. We can also implement the steps necessary to keep spiders away in the future. Fleas are insects that are wingless and feed off of the blood of the animal or human they hitch a ride on. Flea infestation in Florida is a common problem due to the warm, humid environment. Fleas can be very difficult to remove due to their life cycle. A Flea cycles through fours stages: from egg to larvae, pupae to adult. The eggs from the fleas typically take 10-21 days to hatch. This will depend on the temperature and humidity present. In a cold environment this cycle can take several weeks to complete. Flea eggs that are laid on the host but are not attached fall off ending up on bedding, in carpeting and in pet beds or kennels. The female fleas can lay typically hundreds of eggs during her life span. At Pest Control of Spring Hill we understand the life cycle of fleas and the steps needed to ensure efficient removal of fleas from your household. Each year across the United States, termites cause billions of dollars of damage to homes. Typically, termites are living in or near your household for quite some time gnawing away before you notice you have a termite problem. If you think you may have a termite problem, Pest Control of Spring Hill can complete a home inspection to determine the extent of the damage and provide you with the best treatment options available. Typically, mice, rats, raccoons and squirrels sneak into your home looking for shelter, food, water and warmth. In the process of moving into their new home they cause damage to your home. Pest Control of Spring Hill can determine the best way to remove these freeloaders from your household or business and prevent them from coming back. We can handle all of your pest control problems. Whether it's termites, roaches, rats, mice, squirrels, raccoons, spiders, ants, a home inspection or monthly maintenance our professionals can handle it. So submit our easy online form or give us a call today at 352-398-4822 for a home inspection. We will provide fast and friendly service. We don't recommend Do it Yourself pest control, also known as D-I-Y pest control, for many reasons, call us today and we will be more than happy to discuss the reasons why. After reviewing your information we will call you back with additional details on the most efficient pest control and extermination services for your particular situation.